As a cat, Jones' contempt for humanity is not in doubt. But it is only when the Alien boards the ship that he gets the chance to team up with the Alien and get his revenge on his once-captors. Jones has full run of the ship, and his small size means that he has expert knowledge of the ships nooks and crannies and duct systems. Is it any coincidence that the Alien (who as you may recall starts out as a tiny baby Alien) uses these ducts and shafts to great effect, almost as if someone had taught it the best, most undetectable routes? Notably, the Alien then spares Jones. Why doesn't it kill him too? We've seen from Alien 3 that the Alien species has no compunction about killing and using all sorts of animals, not just humans. For the rest of the film, the Alien rampages around the ship, slowly murdering the rest of the crew. Jones is the smallest and weakest of the crew members, and the Alien is an expert tracker. Jones shouldn't have stood a chance, and yet he survives to the end. Very suspicious indeed! The rest of the crew die, leaving only Ripley. 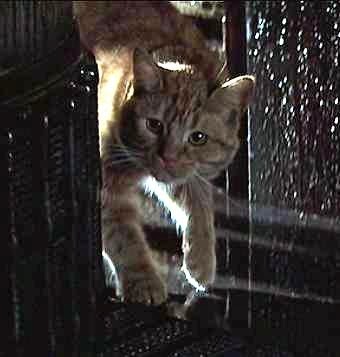 She is spared because Jones needs her alive to operate the escape craft: clearly he cannot as he is a cat, and the Xenomorph probably cannot operate complex controls with its claws. Again though, how does the Alien know to head to the escape pod? Did he and Jones plan on meeting there, getting Ripley to set the controls before murdering here and escaping together? Ripley leaves the shuttle, the Alien comes face to face with Jones, and... doesn't kill him. Of course he doesn't, why would he? He's the Alien's partner in crime. Twice in the film the Alien has the perfect opportunity to kill Jones, and twice it refuses. That's two times more than anyone else! Jones got what he wanted. He had the crew of the Nostromo who treated him as nothing more than an animal and second class citizen, brutally murdered. He returned to Earth a hero. And he used the poor Alien as a cat uses any plaything, discarding him the moment his job was done.